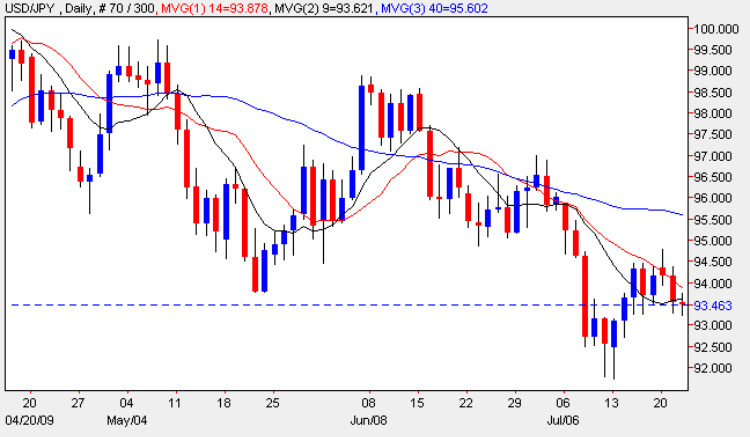 The bearish ‘shooting star’ candle that we saw on Monday, duly delivered in yesterday’s trading session with the yen to dollar currency pair ending the trading session with a wide spread down bar, as the two safe haven currencies continue to slug it out in this narrow trading range. Technically yesterday’s candle was inconclusive, as the high of the day found resistance at the 14 day moving average, and support from the 9 day moving average below, so it is hard to draw any meaningful conclusions from these indicators. With Bernanke waiting in the wings for day two of his testimony, my advice for today is to sit on the sidelines once again, particularly as we have the Japanese trade balance figures due for release during the Asian trading session. This data indicates the difference in value between imported and exported goods during the reported month, and the forecast this time is for a figure of 0.51T against a previous of 0.22T, and as an important piece of fundamental news on the economic calendar, could well introduce further volatility to an already nervous market.